Astronomers have a new insight into the active galaxy Centaurus A (NGC 5128), as the jets and lobes emanating from the central black hole have been imaged at submillimetre wavelengths for the first time. The new data, from the Atacama Pathfinder Experiment (APEX) telescope in Chile, which is operated by ESO, have been combined with visible and X-ray wavelengths to produce this striking new image. Centaurus A is our nearest giant galaxy, at a distance of about 13 million light-years in the southern constellation of Centaurus. It is an elliptical galaxy, currently merging with a companion spiral galaxy, resulting in areas of intense star formation and making it one of the most spectacular objects in the sky. Centaurus A hosts a very active and highly luminous central region, caused by the presence of a supermassive black hole (see eso0109), and is the source of strong radio and X-ray emission. In the image, we see the dust ring encircling the giant galaxy, and the fast-moving radio jets ejected from the galaxy centre, signatures of the supermassive black hole at the heart of Centaurus A. In submillimetre light, we see not only the heat glow from the central dust disc, but also the emission from the central radio source and – for the first time in the submillimetre – the inner radio lobes north and south of the disc. Measurements of this emission, which occurs when fast-moving electrons spiral around the lines of a magnetic field, reveal that the material in the jet is travelling at approximately half the speed of light. 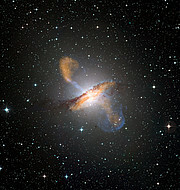 In the X-ray emission, we see the jets emerging from the centre of Centaurus A and, to the lower right of the galaxy, the glow where the expanding lobe collides with the surrounding gas, creating a shockwave. The Large APEX Bolometer Camera (LABOCA), built by the Max-Planck-Institute for Radio Astronomy (MPIfR), is mounted on APEX, a 12-metre diameter submillimetre-wavelength telescope located on the 5000 m high plateau of Chajnantor in the Chilean Atacama region. APEX is a collaboration between the MPIfR, the Onsala Space Observatory and ESO. The telescope is based on a prototype antenna constructed for the next generation Atacama Large Millimeter/submillimeter Array (ALMA) project. Operation of APEX at Chajnantor is entrusted to ESO. The APEX observations of Centaurus A are presented in the paper by Axel Weiss et al. 2008, LABOCA observations of nearby, active galaxies, A&A, 490, 77–86. A German-language page about this image, "Radiosignale aus der Richtung des Schwarzen Lochs im Zentrum von Centaurus A", is available on the MPIfR website.